I love a good stuffed mushroom. 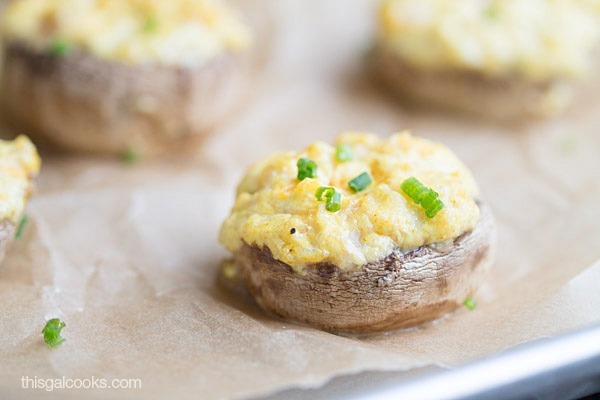 These flavorful Curry Shrimp Stuffed Mushrooms are stuffed with a mixture of cooked shrimp, cream cheese, curry powder and they’re topped with fresh chives. I made them with the leftover shrimp I had from making this Cheesy Chipotle Shrimp and Corn Dip. I’ve had a love/hate relationship with mushrooms for most of my life. When I was a kid, I loved them. I loved them so much that I would eat them raw, straight from a bowl. By the time I reached my teenage years, I hated them. You couldn’t get me to eat anything that had touched mushrooms. Forget picking them off of a pizza that was mistakenly topped with them. I could still taste them. I wouldn’t dare eat that pizza. Luckily, Ken swayed me into trying mushrooms again. It was a late fall afternoon. We were on a date to Romano’s Macaroni Grill. I said what the heck, why not? I ordered a creamy pasta dish with mushrooms. After the first bite, I knew my love for mushrooms had returned. I’m so glad my love for mushrooms returned. 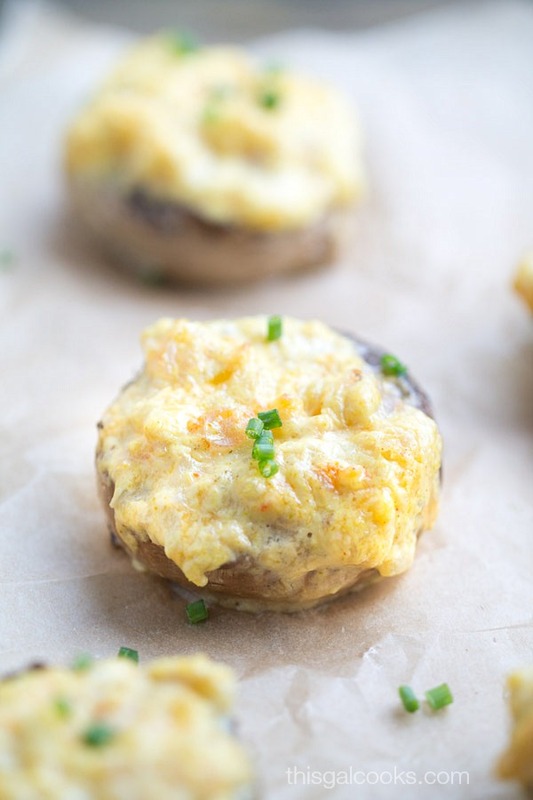 I get to enjoy delicious mushroom appetizers like these Curry Shrimp Stuffed Mushrooms. These little bites of mushroom-y goodness are SO easy to make. Remove the stems from your shroomys. Chop up the shrimp and onions. Mix all of the ingredients in a big ole mixing bowl. Stuff the mushroom caps with that goodness. Bake and then D-E-V-O-U-R! 2 12oz packages of white mushrooms. Look for packs with decent sized mushrooms. Pre-heat your oven to 350. Drizzle a 13x9 baking pan with olive oil. Chop the cooked shrimp into small pieces. In a mixing bowl, combine the cream cheese, shredded cheese, sour cream, mayo, garlic powder, onion, seasoned salt and curry. Mix in the shrimp. Stuff each mushroom with about 1 tsp of the mixture. Place the mushrooms on the oiled baking pan and bake at 350 for 20-25 minutes. Appetizers from some of my favorite bloggers. Hot Crawfish Cheese Dip from Call Me PMc. Potato Pancakes with Shredded BBQ Pork from Culinary Hill. Simple Spinach Dip from It Bakes Me Happy. Looking for even more appetizers? 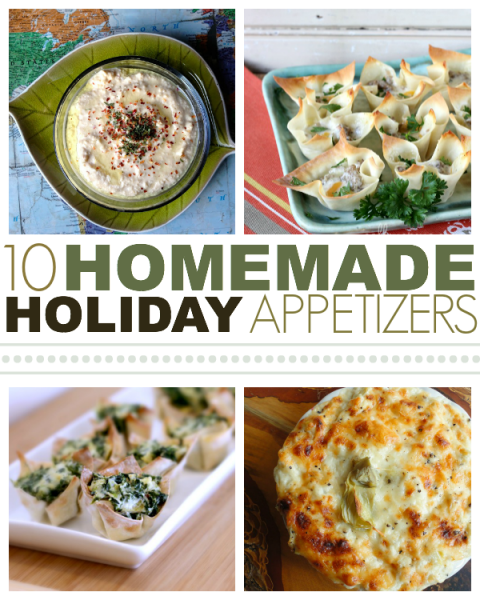 Check out my collection of 10 Homemade Holiday Appetizers. Yum, looks good, Julie. And, I’m starving right now, wish I could reach through the screen! Yummy – thanks so much. You’re welcome. Thank you for stopping by, Liz! 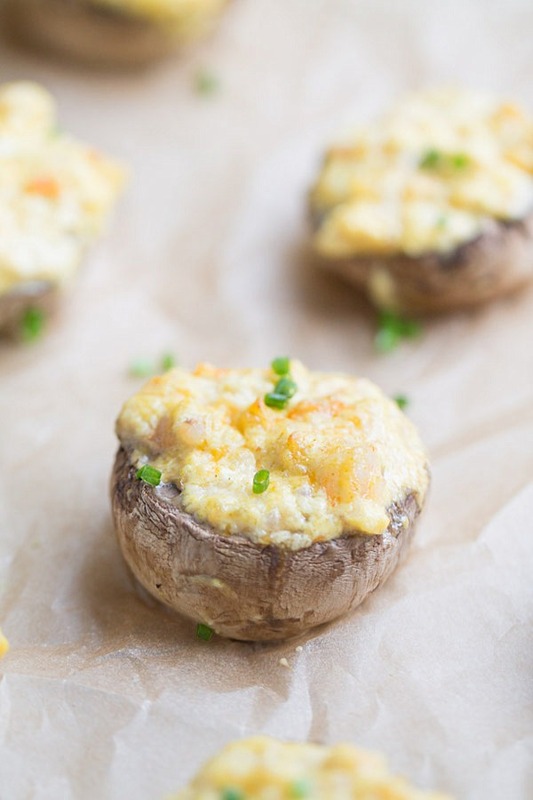 I’m pretty sure I could eat a dozen of these cute little stuffed mushrooms all by myself! I could totally eat that many all by myself! All of that cheesy goodness is calling my name! These are making me hungry. Looks incredible. Julie! Thank you, Carole! Hope you have a great weekend! It’s interesting that your taste for mushrooms changed, Julie … thankfully, you now like them again because I think mushrooms are a great addition to so many dishes. 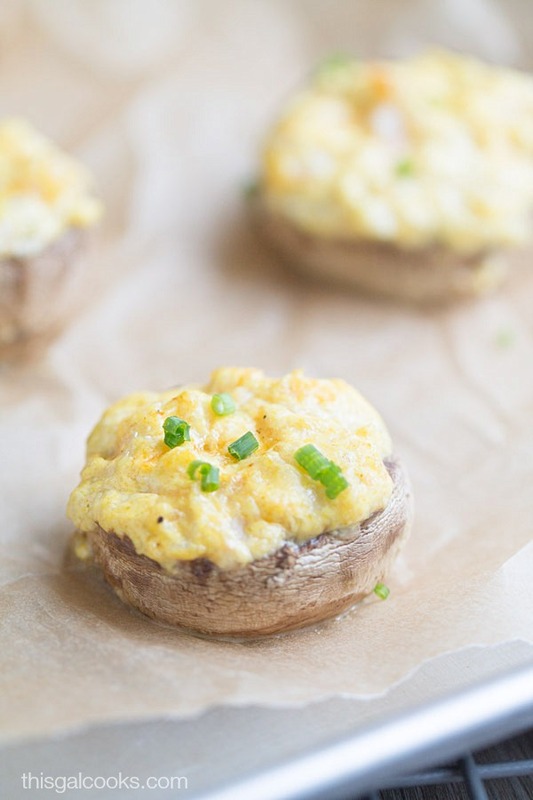 And I love these … they would be perfect little appetizers at a dinner party! It’s funny – I was just writing about different food tastes for my next post. One person’s food hell is another’s food heaven! You know, another food I used to hate that I now like is raw tomatoes. I like cooked tomatoes but I would NOT touch a burger or a taco with tomatoes on it. Luckily, I grew out of that dislike as well. It’s amazing how our tastes change. Cannot wait to read your post! Holy yumminess! I am so in love with stuffed mushrooms, I can’t even tell you. THESE look divine, I love everything here. Shrimp, cheesy goodness, curry powder… delish. Awesome recipe! Pinning! Julie, I also had a complicated relationship with mushrooms :) But luckily, I’ve come around and stuffed mushrooms are some of my favorite appetizers. Your version looks awesome. Curry + shrimp is a match made in heaven! These looks SO GOOD girl!!! Thanks for linking up with Show Stopper Saturday!